The Santa Rita Park playground will open on Tuesday. The playground’s dedication is set for 1 p.m. at the park, 149 S. Camino del Rio. Fences will continue to protect the freshly laid sod. A month after the Santa Rita Park playground was stormed by tiny trespassers, youngsters will be welcomed back. The area will officially open Tuesday afternoon. The city is calling all children to celebrate the opening after a short ceremony, said Cathy Metz, parks and recreation director. There was some confusion in early May about whether the playground was open, and the status of the playground has been a hot topic for parks and rec, Metz said. While the city doesn’t usually dedicate playgrounds, so many people have asked for a grand opening, the department decided to host one. The inspiration for the $375,000 playground came from Durango High School students, who brought ideas for a more accessible playground to the Durango Parks and Recreation Department in 2014. The freshmen students studied accessibility issues and looked for ways to apply what they learned in the community. While the woodchips used for many playgrounds are acceptable under federal law for those with disabilities, the rubberized material at Santa Rita that was poured over concrete is much easier for those using wheelchairs and crutches. It is the only playground in the city to have this material. “They wanted us to have a more inclusive playground,” Metz said. A $150,000 state grant from the energy impact assistance fund helped make it possible for the city to fulfill the student’s vision, she said. It replaced a structure from the 1980s for which the city could no longer find replacement parts. 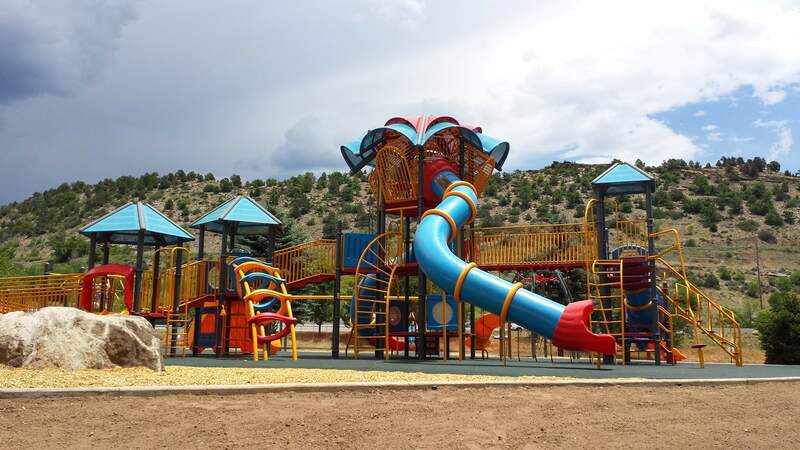 The dedication of Santa Rita Park playground is set for 1 p.m. Tuesday at the park, 149 S. Camino del Rio.